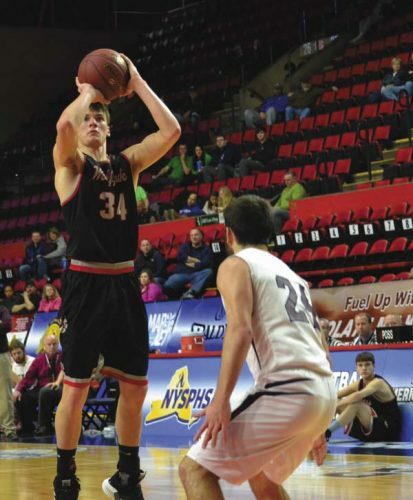 UTICA — Justin Stead connected on five 3-pointers and finished with 21 points to lead Mohawk Valley Community College to an 85-60 victory over Fulton-Montgomery Community College in a Mountain Valley Conference men’s basketball game Saturday. The Vikings outscored the Raiders 45-24 in the second half to earn the victory. Jordan Cuevas-Marte had 20 points, six rebounds, two steals and two assists for MVCC, while Jamale Cummings had 16 points and 11 rebounds. Darren Demmitt and Jahmr Jordan each added 10 points for FMCC. Demmitt also grabbed nine rebounds for the Raiders. FMCC (14-3 overall) is scheduled to travel to Herkimer on Monday for a 6 p.m. contest. Pardie 1-0-3, Diakite 5-2-14, Toussaint 3-0-7, Demmitt 3-3-10, Jordan 3-3-10, Hudson 1-0-3, Dhieu 1-0-2, Malone 4-1-11. Totals 20-9-60. J. Dean 4-1-9, Mehmetaj 2-0-5, Stead 7-2-21, Cuevas-Marte 7-3-20, Lucas 2-0-4, Cummings 7-2-16, M. Dean 1-2-4, Hollimon 2-0-4, Sullivan 0-2-2. Totals 32-12-85. 3-point goals: FMCC 8 (Diakite 2, Malone 2, Pardie, Demmitt, Jordan, Hudson); MVCC 9 (Stead 5, Cuevas-Marte, Mehmetaj).